Iranian gov't claims 2 officers killed, 2 others wounded when protester opens fire on officers during demonstration. Two Iranian security officers were killed and two more wounded when a protester opened fire on police during an anti-government demonstration in Najafabad on Monday, the Iranian government claimed. Protesters have clashed with Iranian police in a wave of demonstrations across the country beginning last Thursday, when anti-government protesters chanted “Death to Rouhani” and “Death to the dictator”. While President Hassan Rouhani campaigned as a reformer, unemployment and consumer goods prices both remain high, despite increased revenue following the partial lifting of sanctions on Iran as part of the 2015 Iran nuclear deal. The protests later spread across the country, becoming the largest popular uprising since a wave of anti-government protests in 2009, following Iran’s presidential election. Since Saturday, Iranian security forces have killed at least 12 protesters, The Associated Press reported Monday. 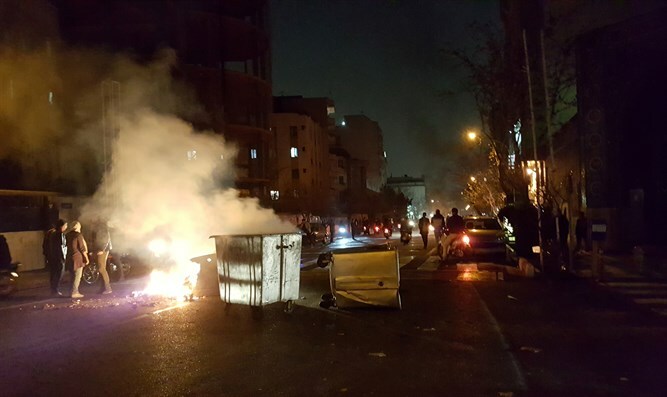 Later on Monday, Iranian state media outlets claimed that a gunman opened fire on security forces stationed in the city of Najafabad during an anti-government protest. Later Monday night, Iranian news claimed the death toll in the shooting incident had risen to two, Maariv reported. The Iranian government also claimed that armed demonstrators have attempted to seize police stations and military facilities across the country. In the predominantly Kurdish city of Kermanshah on Sunday, protesters were filmed beating a local militia member allied with the Iranian government.